Do not let the sheer length of this book or the hype it has been given stop you from reading it, because it is amazing!! I have owned this book for at least three years and I always put off reading it, because it was SO long. This week, however, I finally started it and finished it in 24 hours! That is how good it is. I kid you not. I love the idea of factions. It was such a neat concept to have different factions based on personality traits. The entire time I would find myself trying to figure out which one I belonged to as Tris described each one. I think I may be Divergent, though. The process of choosing which faction you belong is was also very interesting and reminded me a little of both Harry Potter and sorority bid day lol. Tris is a very strong character and one that you can easily build a strong connection to. She has a fear of trusting people so a lot of the time she is in her head with the reader, and because of this I feel like I truly know who Tris is. Veronica makes sure her readers will have a strong bond with Tris and will fall in love with her. Like with Katniss, everyone will want to be Tris. She is a strong independent woman and I too, just like Katniss, want to be Tris. I found another book character hero! Another thing I really liked about this book was that nothing felt repeated. A lot of times books will remind you of things too many times, or they will hint at something too strongly, and now the reader knows how it ends, but I found myself guessing the entire time what would happen next. Everything was also very original. I find that once you start reading from a certain genre that there are only so many "original" things that can happen. I mean once you've read a vampire novel you have kind of read them all. There will be something different about every single one, but they all have the same outline and Divergent didn't feel like that all. It all felt original and new to me. It was definitely it's own outline. I loved that there was a lot of death and tragedy. I know that is a really morbid thing to say, but I like that Veronica wasn't scared to kill off characters. It definitely gave the book a much darker feel and made me more drawn to it. What does that say about me? I don't want to know, but I enjoyed it. I absolutely cannot wait for the movie. I really think it is going to be awesome. If they do half as good of a job on Divergent, like they did on The Hunger Games, it will be fantastic! I mean, they really can't mess up the movie too much (knock on wood), because the sheer detail in Divergent is astounding. I could literally see everything in my head as clear as day AS IF I was watching the movie already. I will admit that I was a little apprehensive when I learned that Shailene Woodley was cast as Tris, but now after reading Divergent I think she will do great! Absolutely amazing! The sheer detail in this book, alone, will astound you and make you that much eager to see the movie in 2014. Tris is an amazingly strong character and will definitely be compared to Katniss. She is definitely my new book character hero. 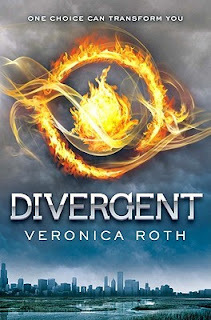 Divergent is very original and don't think I could really compare it to any other books. It was all very fresh and new. I loved how dark this book was and that Veronica wasn't scared to kill or hurt a few characters to get the desired effect by the end. This book was fantastic and I cannot wait to read the rest in the series. GO BUY AND READ IT NOW!